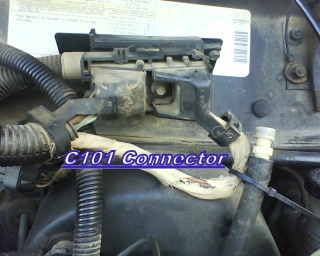 The C101 connector on 1987 and 1988 Renix Jeeps was a source of electrical resistance when the vehicles were new. So much so that the factory eliminated this connector in the 1989 and 1990 models. 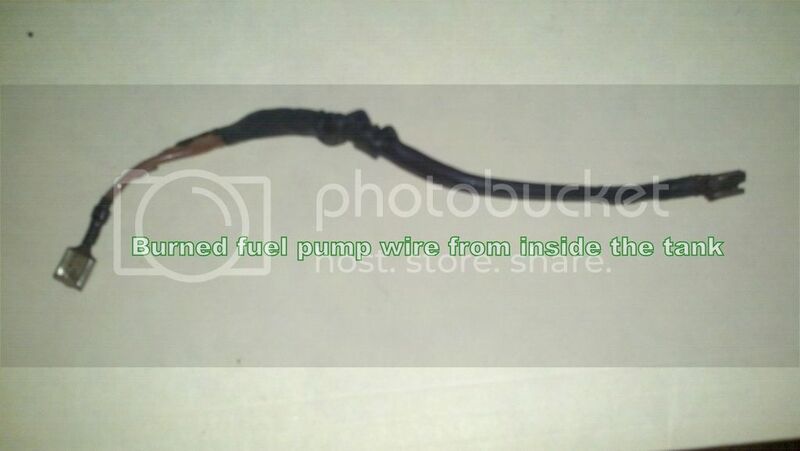 The factory recommended cleaning this connector to insure the proper voltage and ground signals between the ECU and the fuel injection sensors. We can only imagine how this connector has become a larger source of voltage loss and increased resistance over a period of more than 25 years. The C101 connector needs to be cleaned at least once in the lifetime of your vehicle. Chances are it’s never been done before. Almost every critical signal between the engine sensors, injectors, ECU, and some to the TCU, travel this path through the C101 connector. That said, the cleaning described below is a real MUST DO right off the bat for any new-to-you Jeep. But, I strongly advocate eliminating the C101 at some point by following the procedure with photos and video in Tip 27. Soldering skills are required and it takes about an hour and a half. The C101 connector is located on the driver’s side firewall above and behind the brake booster. It is held together with a single bolt in it’s center. To get the connectors apart, simply remove the ¼” bolt and pull the halves apart. You will find the connector is packed with a black tar-like substance which has hardened over time. Take a pocket screwdriver or the like and scrape out all the tar crap you can. Follow up by spraying out both connector halves with brake cleaner and then swabbing out the remainder of the tar. Repeat this procedure until the tar is totally removed. This may require 3 or more repetitions. Wipe out the connectors after spraying with a soft cloth. If you have a small pick or dental tool, tweak the female connectors on the one side so they grab the pins on the opposite side a bit tighter before bolting both halves back together. The issue at 1/4 tank got my attention. Have you ever tested your fuel pressure? 31 at idle with the vacuum line connected to the fuel pressure regulator and 39 without it disconnected. 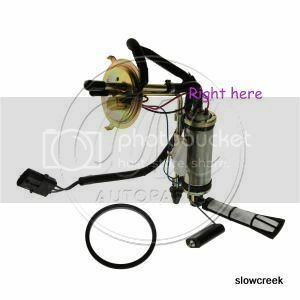 The internal hose from the fuel pump to the outlet of the tank may be compromised, or the internal ground wire may be loose. . 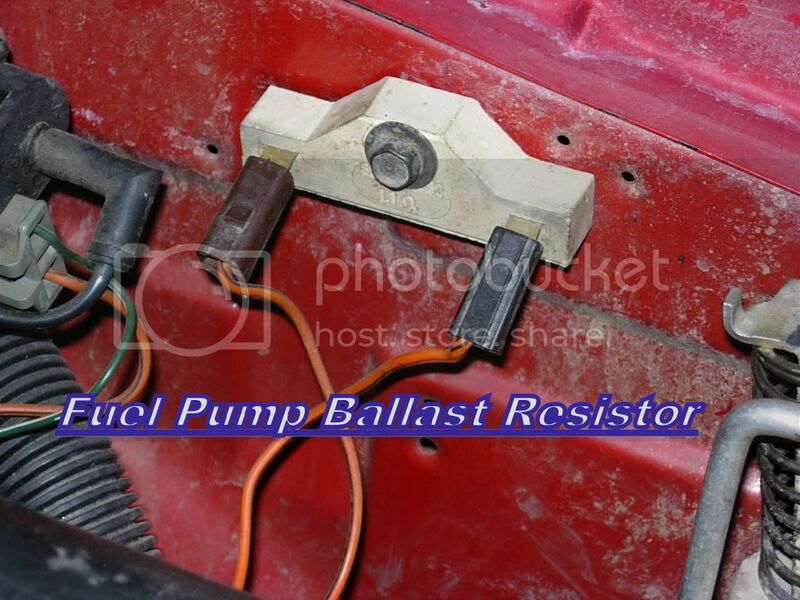 I might also try bypassing the fuel pump ballast resistor on the driver’s side inner fender. Look VERY closely at the line from the throttle body to MAP sensor. I found the fuel pump ballast located on my fire wall next to the c101. I was going to relocate it by the EGR valve. Also I see in the picture that there’s a single orange wire to each connector on the ballast….mine has 1 on one side & 2 on the other…I haven’t found info on that. When I got that map sensor from the Junk yard & plugged it in…..it made my jeep shake & vibrate when accelerating. Now the old map sensor does it too but didn’t before. 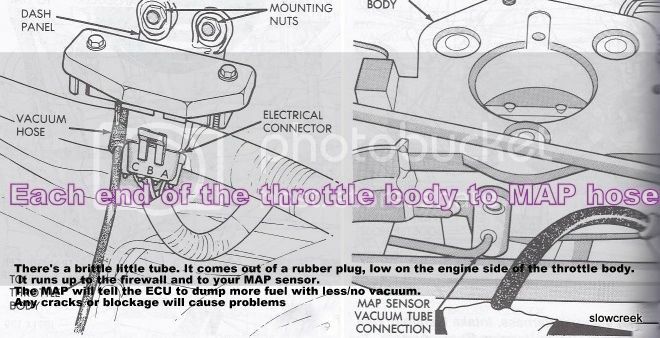 Check the pins inside the harness side of the MAP sensor connector. You still have the C101? Bypass the ballast resistor just for the heck of it. Yes I still have the C101. Its still connected. I also found a disconnected wire but can’t find where it goes. 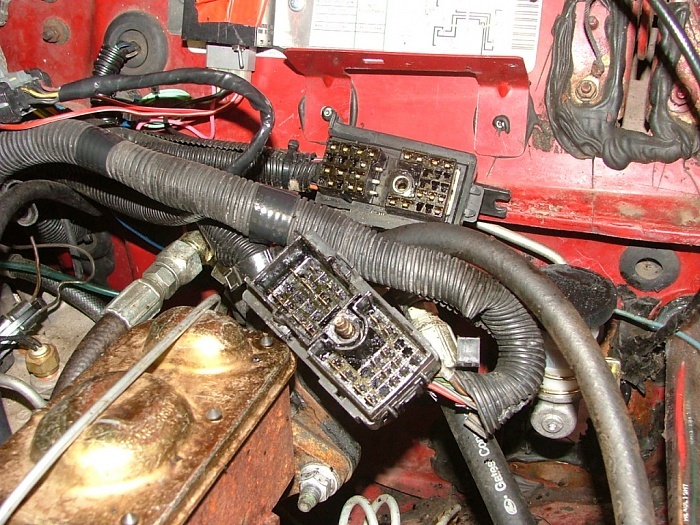 The wire starts off from the “battery terminal” connection on the Starter relay. Its a green wire that quickly turns into 3 red wires. 2 of the wires go into the wiring loom & go through the grill around to the firewall. The 3rd wire isnt connected to anything But has a “connection” crimped on the end. The “Connection” is broken off but the Crimp is still on. 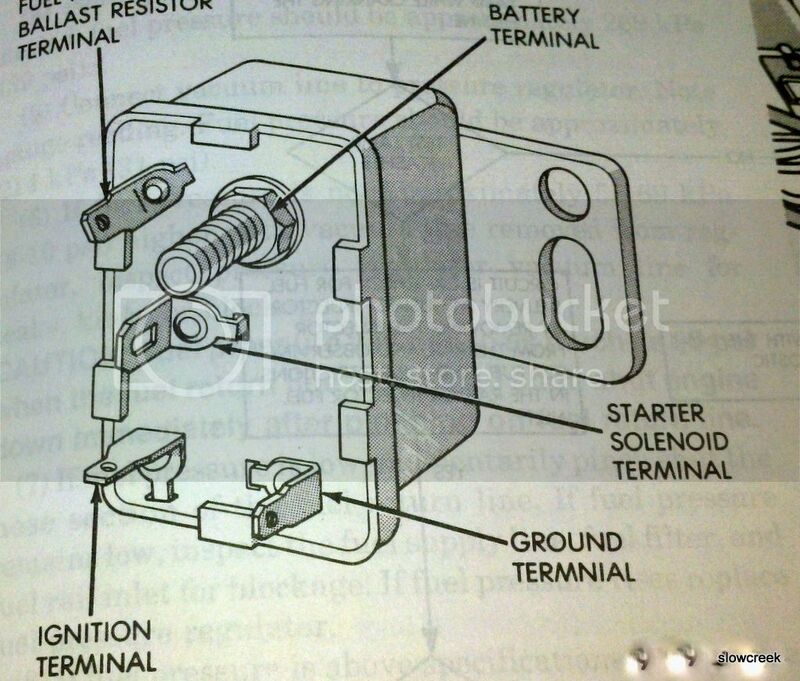 The only info online I found on this is that it could possibly go to the latch relay. I can’t find where it would connect to on the latch relay though. And, you should eliminate your C101 sooner than later. Tip 27. First off, I’m glad to see the Tips have helped. Have you ever tested CPS output? Tip 7. Keep in mind it’s signal travels through that nasty C101 connector. Have you at least cleaned the C101 in the meantime? I have pulled c101 apart and cleaned. I haven’t checked the out put. Everything I read says if intermittent then won’t catch it with test. I am leaning towards coil, cap, cam sensor and wires next. Just noticed brake fluid in driveway. Looks like may be from new master cylinder. 1 step forward 2 back with this @$!#£?+₩ jeep! Well I fixed the cut out. I wanted to wait a few days and add some miles before making that statement. I pulled the coil and cleaned contacts and did the same with distributor cap. While there I realized I had never pulled the cam sensor connector apart for cleaning. I think this is where the problem was. It was wet with motor oil! When I got this jeep in October it was leaking oil pretty bad from the valve cover and ccv grommets. It had a combo of cork and rtv for a gasket. While I had it off I did the V.C. mod. New grommets and a blue felpro gasket rook care of the leak. I cleaned the oil out and have driven 100 trouble free miles. Now that’s fixed, my m.c. reservoir starts leaking! I had pulled the reservoir to clean it when I did the wj booster upgrade. That was 2 weeks ago, 300 miles without leaking. I’m guessing the grommets that mount it to m.c. are bad but the dealers can’t get me just the grommet. Reservoir from dealer was just under $200. And m.c. was close to $400. 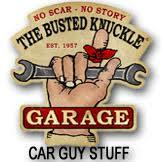 I’m headed back to junkyard for grommets and or another m.c. combo for $30. 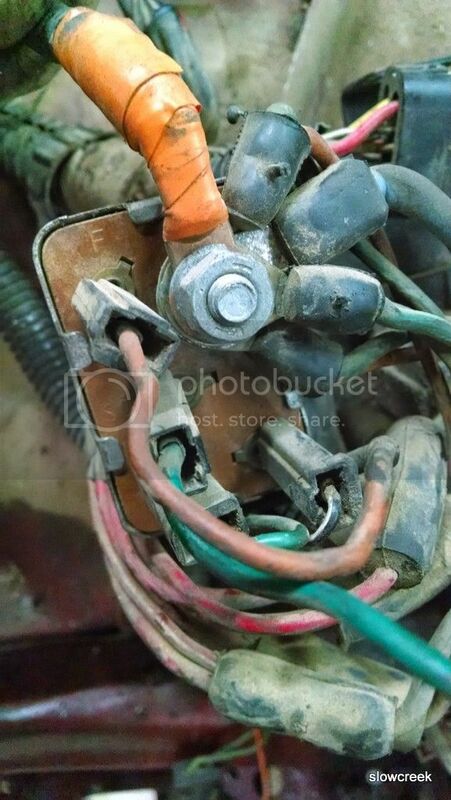 Other than the C101 connector, was there much difference between the engine wiring harness from 1987 to 1989-90? would a 1987 harness (TBI, from my understanding) work with the MPFI engine, with the extra wires for each injector added to the correct pin outs? the ECM seems to have been the same , so the plug should also be the same? If i had accidently applied +12vdc to pin d13, “ign interface out”,of my ecm (jumped the wrong yellow wire at ign coil to b+ while troubleshooting a no spark issue) would that have positively fried my ECM? Possibly. I’ve never done it…. What’s the symptom at this point? That is the C100 connector. Your C101 has been eliminated by someone. I would make sure every connection is soldered. True tales from "The Book"
Cruiser fans get 15% off storewide! Use "CRUISER54" at checkout!